I hope that you as I have enjoyed our kitchen journey through this busy month of Christmas reading and hopefully getting inspiration for your own kitchen creations from my daily Christmas Calender posts for 2016, as I have enjoyed the time spend time making them in my little kitchen. I keep myself entertained during the dark and grey Winter time creating my very own Christmas Calendar just like the ones on TV ! For me it is a way for keeping my mood up during a long, dark, gray and rainy Winter season with days having around 7 hours of sun light in case, that the sun actually shows it´s face ! as it keep me busy instead of hiding under my duvet like a little moody and sleepy brown bear !!! So I baked different stuff and made Christmas sweets, which I have been using as stocking fillings for a good colleague at work as well as serving all these goodies at both and filling up all the empty tins of my mother. My mother prefers these brown cakes, as they are softer to chew than both these giant pepper cookies (my personal preference due to great taste of pepper) and Christmas biscotti. Looking into this TOP 5 list I will concluded, that together we have enjoy a great Christmas afternoon tea, which was also the theme of Christmas Calendar 2016. I will already now promise you, that I will make a new Christmas Calendar in 2017. If you have an idea, please feel to leave a comment. You are also more than welcome to share your opinion on the Christmas Calender 2016 at the same time. This time we went for our usual tapas selection from Osteriet with company in form of two home-made breads: saffron bread with Nigella seeds and durum bread with beer and walnuts. As tradition demands we started the Christmas lunch with a bobbling Christmas glögg cocktail. The tradition also describes, that we have to play the gift play (pakkeleg in Danish) using a specific card game, so not dices as normal. All participants bring between 2-8 gifts, and in the card game you either end up with most of the gifts or not gifts at all. As the gifts can be everything between soap, paperbacks, ugly Christmas decorations or left over Christmas food, it is not good to get all the gifts ! I think for the very first time in my kitchen I have been a green healthy looking juice, which I actually like, and which I can drink as a soft drink. I actually find this juice to be too sweet in the taste, so you could easily reduce the amount of apples, if you prefer less sweet juices. I think it is time for some refreshing juice after eating plenty of cakes and sweet treats during the month of December. December is a month full of various citrus such as orange, clementines and grapefruit, so these citrus fruits are used for this juice. It is a juice, which you could enjoy during the upcoming Christmas holidays. I juice the citrus fruits wihout peel, as the peel gives bitterness to the final juice. If you would like to have some bitterness in the juice, you could juice one, two or more of the citrus juice with the peel on. In case you juice with citrus peel, it is important, why you use organic citrus fruit or citrus fruit without surface treatment of the citrus fruit. Juice all the citrus fruit together. 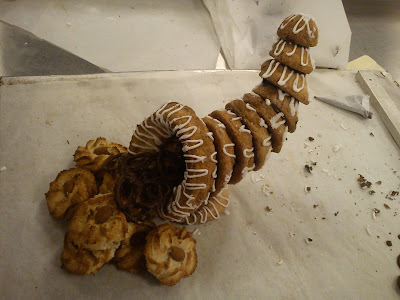 As a modification to the Christmas apple stick, I would made a version without apple. This was actually a good decision, as some of the guest for my Christmas coffee were not to keen on baked apples. Add all the dough ingredients into the mixing bowl of the stand-alone mixer. Knead the dough for 5 minutes on speed 2. Cover the mixing bowl with a tea towel, and let the dough raise for 45-60 minutes. Add butter and sugar into mixing bowl, stir into a homogeneous mass by hand. Afterwards add in the marzipan, chopped almonds and sucat, stir everything together. Divide the dough into two portions. Place each dough portion on a piece of baking paper. Roll each dough portion into 15 x 25 cm. Divide the filling into 2 two portions. Place the filling portion in the middle of the dough. And spread out. Cover the filling with rest of the dough. Move the kringle with baking paper to the baking tray. Glaze the dough with whipped egg. Bake the kringle at 220'C in the middle of the oven for 20 minutes. Bake the kringle, until they are golden. Cold down the kringle on a oven rack. Slice the apple sticks, when they are cold. Since I first tried to bake these Ester's apple sticks in Autumn, I have known, that I wanted to make a Christmas version of them full of cinnamon, sucat and marzipan. 1 apple - sliced into thin boat shapes. Place the apple boats on top of the filling. Sprinkle the apple pieces with chai sugar. Cover the filling and apple with rest of the dough. Move the apple stick with baking paper to the baking tray. Bake the apple sticks at 220'C in the middle of the oven for 20 minutes. Bake the apple stick, until they are golden. Cold down the apple sticks on a oven rack. I have been looking forward to try out this recipe from the weekly magazine "Søndag" (issue 29/2016) for quiet some time. And I found it to be fitting perfect into this theme of Christmas afternoon tea. Instead of fresh cherries I have used Amarena cherries, which is very fitting in this season of Christmas. The taste and texture is great. The taste of jasmine tea in the cream topping is very delicate, I had some issues in tasting the jasmine tea flavour, however some of my work colleagues could not identify the flavour of jasmine. Add in the sugar and whip until the mass is very stiff. Add in the chopped hazelnuts, and mix everything gentle together. Fill the mass into a spring form, where the bottom layer is covered by baking paper. Place the form in middle of the oven, and bake the bake at 175'C for 30 min. Check, that the cake is baked, before removing it form the oven. Sprinkle the top of the cake with cocoa powder. Add the jasmine tea and dairy whipping cream into a cooking pot. Remove the cream from the heat, and let the jasmine tea infuse the cream for 5-10 minutes. Pour the cream through a sieve in order to remove the tea leaves. Add the cream and chopped white chocolate into a mixing bowl, stir until the chocolate is melted. Cover the mixing bowl with a lid, and place the cream cold in the refrigerator for min 4 hours or night over. Whip the cream, until it has a consistency as whipped dairy cream. Fill the whipped cream into pipping bag. Pip the cream in form of small tops on the top of the cake. Decorate each cream top with Amarena cherry. Store the cake cold, until it could be served for the guests. Another way of enjoying mulled wine could be to serve a cocktail made from mulled wine and sparkling wine. 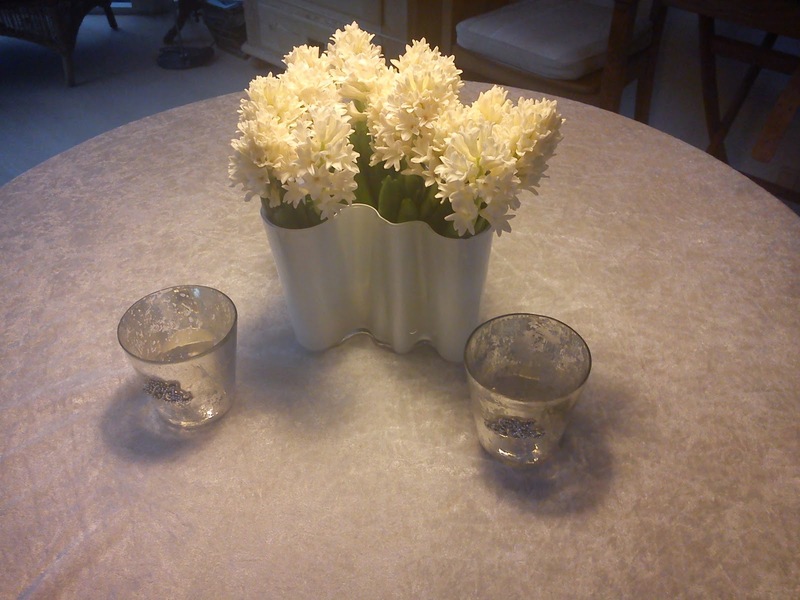 I always like to serve a glass of sparkling wine, when I am having guests coming around. It gives that extra luxury feel, and the talk between the guests always start running very fast. 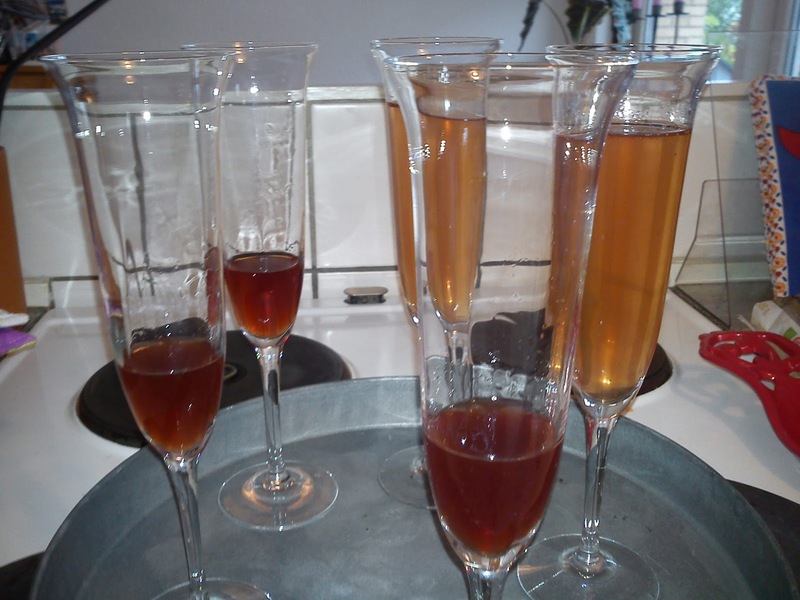 Fill the glögg extract into a champagne glass. Fill up the rest of the glass with sparkling wine. Cheers - wish you a merry Christmas. It is about time, that I bake some scones for this Christmas Calendar of 2016 with focus on afternoon tea. These scones could be served with butter, clementine curd and tea/coffee. I really the taste of the scones, which was fantastic. 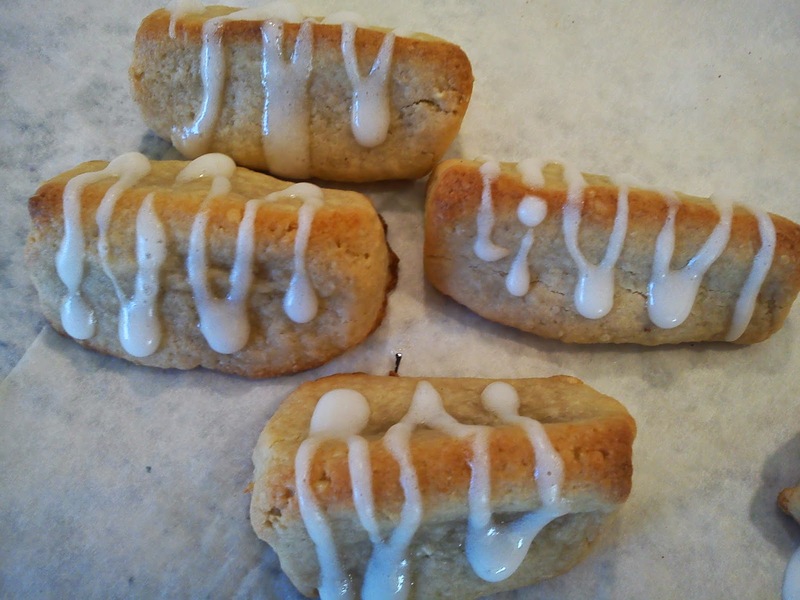 However, I was not to happy about the texture of the scones dough, so I would next time use this recipe on classic scones as starting point. Whip the milk, orange juice and egg together and add it the dry ingredients. Combine it into a homogeneous looking mass using a eating knife. Serve together with butter and clementine curd. The final sweet treat for the Christmas of 2016, which time is form white chocolate - lemon curd truffle coated in white chocolate. So if we do not get a White Christmas, when I can at least serve White Christmas marzipan sweets. I have found this recipe in the magazine "Isabellas" (issue 06/2016), and I have made no modification to it. Heat up the dairy whipping cream. Chopped the white chocolate (200 g), add it to a mixing bowl. Pour the cream over the white chocolate. Place the mixing bowl in a water bath. Stir until the white chocolate in melted. Add into the almond flour and lemon curd. Place this chocolate mass cold inthe refrigerator for 2-3 hours or night over. Use two tea spoons to form the truffle mass into ball shape. You can use your hands for the last finishing touch. Cover the truffle mass in the melted white chocolate, one piece by the time,so the truffle mass does not melt in the melted chocolate. Sprinkle the truffle balls with decoration viols. Lets the chocolate dry, before the truffle is stored in air tight containers in the refrigerator for later use. Christmas is getting closer, and so are the guests, which I have invited for Christmas evening coffee, so I need to make some more marzipan sweet treats. 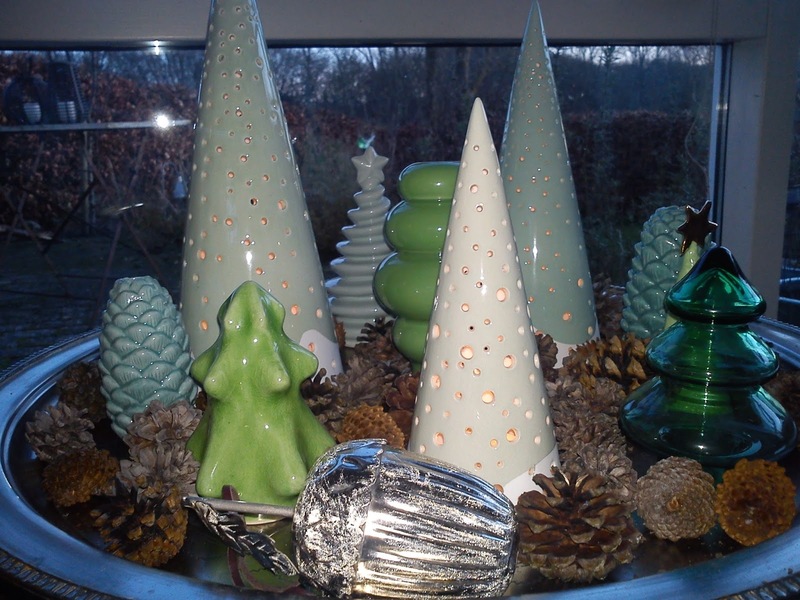 This time I am using an recipe from a special Christmas feature from the weekly magazine "Søndag". Knead the marzipan, orange zest and liquorice powder together. Shape the marzipan in a thin roll, which is cut into 16 pieces. Store the marzipan pieces cold for 2-4 hours. Cover the marzipan pieces in the melted white chocolate. Sprinkle the marzipan pieces with chopped pistachio. 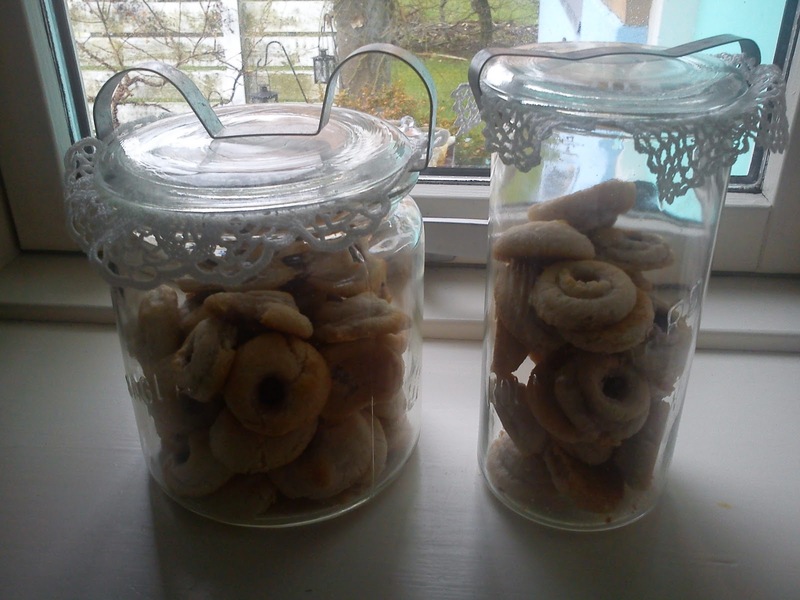 Lets the chocolate dry, before the liquorice-orange marzipan sweet treat is stored in air tight containers for later use. 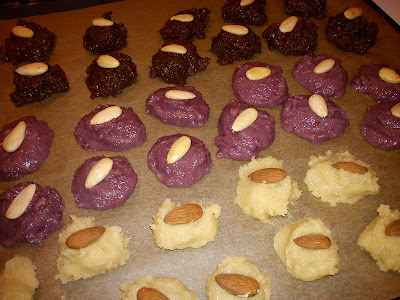 It is time to make some "konfekt" sweet treat with marzipan as main/important ingredient. The flavouring part is cherry, which is another traditional fruit in connection with Danish Christmas. 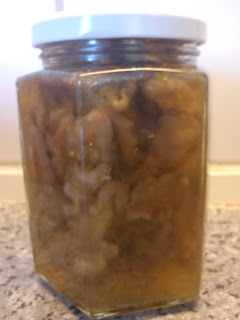 I have been used sweet pickled cherries from Sellenberg, which I brought at the Christmas fair at CLAY. Add the marzipan and sweet pickled to a mixing bowl, where you knead it together. Divide the marzipan mass into 30 pieces, which is rolled into ball shape. Store the marzipan balls cold for 3-4 hours or night over in the refrigerator. Cover the marzipan balls in dark chocolate. Drizzle freeze-dried raspberry on to the dark chocolate. Lets the chocolate dry, before the cherry marzipan sweet treat is stored in air tight containers for later use. Instead of the more traditional lemon curd I have been making clementine curd using this recipe on lemon curd as starting point. Clementine is in season in connection with Christmas, so I though this twist to curd would be very fitting to this year´s Christmas Calendar. If you look in later this month you can see, that I have been using this clementine curd for. If you notice, that your curd is not firm enough in the glasses after the cooking, you can empty the glasses and give it a new cooking up to have more denaturation of the egg protein, as this will give thickness/firmness. However, it is very important, that the curd is not boiling as this will give an unpleasant grainy texture. 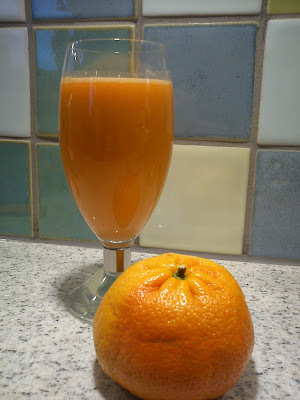 Take the zest from the clementines as well as squeeze the clementines for their juice. Afterwards add in the clementines zest and juice. Heat on the clementine curd mass on low heat, stir very well in the mass, heat the mass until it thickens. The clementine curd must not boil. Pour the clementine curd into the prepared containers/glass and place them in the refrigerator. In case you add no preservation to the clementine curd, the shelf-life of it is approx. 1 week, when stored cold in the refrigerator. Last Wednesday evening my mother and I went drove to Middefart to experience the Christmas fair at CLAY. Besides from a few ceramics displaying their work it was also possible for both taste and buy cherry products from Selleberg. I went away with some cherry products for use in my kitchen in connection with Christmas as well as a new ceramic cup for drinking tea made by Line Skovlod. It is time to make some glögg extract (mulled wine extract), and in this case you need to do some planning, as the process involves 3 days of infusion of the extract in the refrigerator, so it is not an easy fix. A faster version would be this mulled white wine, which requires a night over infusion with the spices. It is also the first time, that I see the use of vanilla pod in glögg extract, all the other spices are the classic Christmas spices. 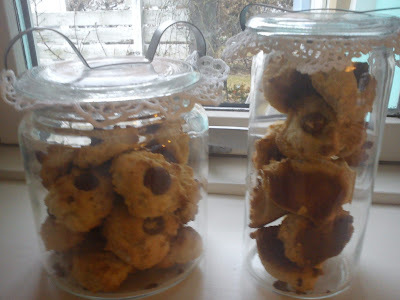 I have found this recipe in either "Alt for Damerne" or "Femina", I do not recall. This glögg extract can be heated up with raisins and almond pieces to be served warm as traditional glögg. Another option is to heat it up and pour into a cup of black tea or to be served as Christmas cocktail, which is the purpose I am intending to use this glöog extract for. All the ingredients into big cooking pot. Bring it to the boil, and let it simmer without lid on. Let the liquid reduce slightly. Pour the liquid and all spices into a large mixing bowl. Let glögg extract be infused in the refrigerator for 3 days. Sieve the glögg extract and pour the liquid in to storage glass. Store the glögg extract cold until use. I need to fill more of my many cookies tins, so today it is time to bake a giant version of the classic pepper cookies (pebernødder). The good thing about the giant version is, that it does not take forever to roll the pepper cookies into ball shape. I have found this recipe in the weekly magazine "Søndag" (Julen 2016 issue). Add flour and all the spices into a mixing bowl, and mix everything together. Add in the lemon zest, almond flour and sugar. Add the butter pieces and rub the butter into the flour mix, until it look like fine breadcrumbs. Add in the eggs, and form the mix into a dough without kneading it too much. The dough should be more pressed together. Store the dough cold in the refrigerator for 1 hour. Divide the dough into 4 portion, which is placed on cling film and roll into roll with a diameter of 3 cm. Cut each roll into pieces of 2 cm, and roll the pieces into ball shape. Bake the pepper cookies at 200'C for 10-15 minutes, until they are golden in colour. Cold down on a rack, before storing the pepper cookies in airtight containers. 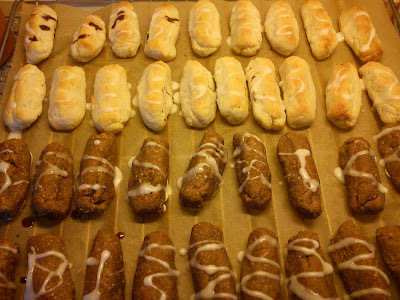 It is time to make some sweet treats with marzipan. 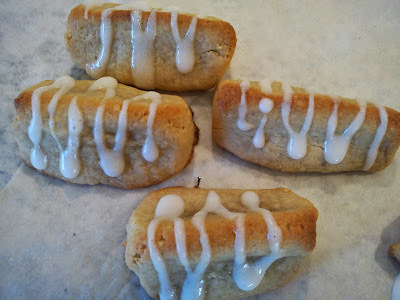 I am starting off with an easy type of marzipan sweet treat, which does not involve any coating in any kind of chocolate, so no messing around with tempering chocolate. I have found this recipe in the weekly magazine "Søndag" (issue 47/2016). I could not locate the mentioned raspberry dust in any of the local supermarket, so instead of I milled freeze-dried raspberries into some very fine powder using my excellent kitchen helper bamix. Knead the marzipan together with freeze-dried raspberry, almond flour, raspberry colour and flavour. Divide the marzipan into 4 portions, which is rolled into 4 rolls. Cover the marzipan roll with the raspberry powder. 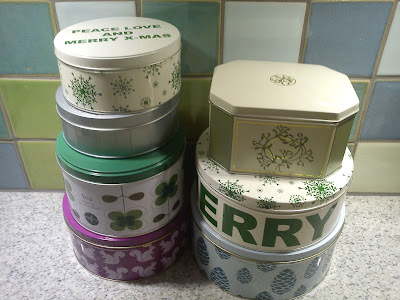 Store the marzipan rolls cold in airtight container. These pickled nuts are great served together with cheese. The Christmas part of these pickled nuts is the use of cinnamon and orange. I have found the original recipe in the weekly magazin Sndag (issue 51/2013). However, I have made various modifications, so using the ingredients available in my kitchen instead of buying the actual ingredients mentioned in the recipe. Start by boiling the nuts in the water for 2-3 minutes. Drain the water from the nuts. Add orange juice, orange zest, apple vinegar, honey and cinnamon into a cooking pot, and bring them to the boil. Add in the boiled nuts. Let the nuts simmer for 5 minutes. Prepare the storage glasses by adding boiling water to them first. Divide the nuts between the glasses and divide as well the liquid between the storage glasses. Store the pickled nuts in the refrigerator. Another great cake for some Christmas afternoon tea full of the many fantastic Christmas spices with a touch of liquorice (it is only at touch, so my friends in Horsens could relax reading this blog post). I found this recipe in the magazine Isabella (issue 6/2016). I have made a few modifications, as I would not find all the needed ingredients in my local supermarket, and I did not want to spend another 1 hour going to a second supermarket to see, if they had the mentioned ingredients in the original recipe. I found it quiet intriguing, that the recipe contains both baking soda and baking powder, so I talk with one of my colleague at work, who is baker, for what reason two types of baking powder was used. The use of baking soda is used as baking powder, when used in recipes with buttermilk, which is not the case here. However, baking soda also gives a more dark colour in chocolate cake, so the amount of cocoa powder can be reduced. And this cake, where is used plenty of brown spices and sugar, so I think the baking soda in this cake is used to give a more dark colour in the final cake. Bring the water to boil, pour into a glass and add the baking soda into the glass. Mix flour, baking powder, ground ginger, cinnamon, nutmeg, liquorice powder and salt together in a mixing bowl. Add butter and sugar into a second mixing bowl, where it is whipped into a airy mass. Add the syrups and water-baking soda into the butter-sugar mass, while the whipping is continued. Afterwards add in the flour and spice mix into the dough, and whip add. Finally add in the egg, and whip again. Pour the cake dough into 2 small or 1 big form. Bake the cake at 180'C for 30-40 minutes. Check with a pin, that the cake is baked, prior to removing it from the oven. Let the cake cold down, before you slice it. Enjoy a slice of cake together with a nice cup of tea.